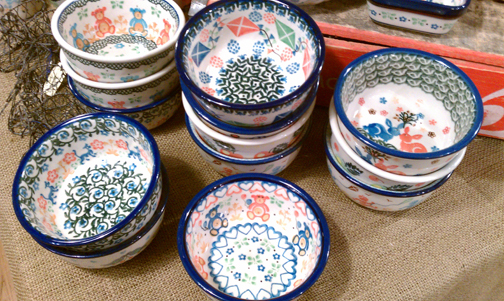 …supplied plenty of visual candy when visiting the polish pottery place at pike place market in seattle, washington. located beneath the actual marketplace, i was dazzled when i walked downstairs and was met by an overload of beautiful old world prints and patterns! racks and tables were filled with carefully grouped clusters of crockery, pitchers, ladles, mugs and so on each arranged according to color and theme. i had the opportunity to speak with the enthusiastic owner who proceeded to give me a history of traditional polish pottery and crafts. established in 1950, ceramika artystyczna cooperative of boleslawiec, poland was formed to reignite the polish ceramic industry which had been halted as a result of world war II. 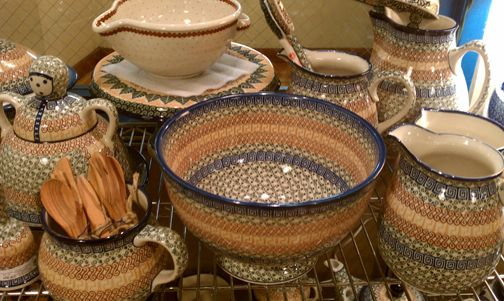 the fine white clay which is used is some of the strongest and most durable in ceramic fabrication which beautifully sets off the earthy neutrals and bright colors of the hand painted glazes. many of the designs reflect traditional folkloric motifs of whimsical animals, graceful florals and decorative geometrics resulting in enchanting table ware fit for a fairy tale feast! 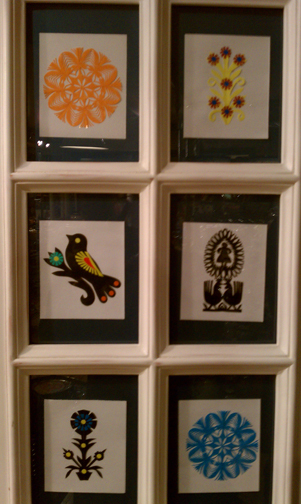 another feature of the shop not sold online is the handcrafted art of wycinaki, paper cutout. it became popular in the 1800’s as polish peasants used them to decorate their homes and as gifts for friends and loved ones. 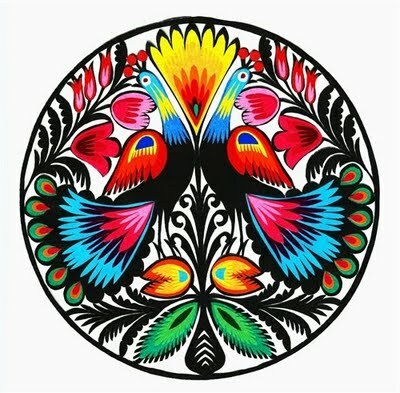 the intricate designs are painstakingly cut by hand and layered to create symmetrical floral bouquets, roosters, deer, birds, etc. many of the designs she showed me ranged from the simplistic to much more elaborate compositions. 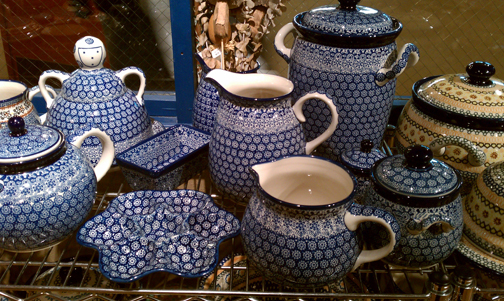 please visit the polish pottery place to see more of their wares. keep in mind the online site carries but a fraction of what’s available in their shops and only a visit to the locations can actually do justice to seeing such an abundance in one spot. 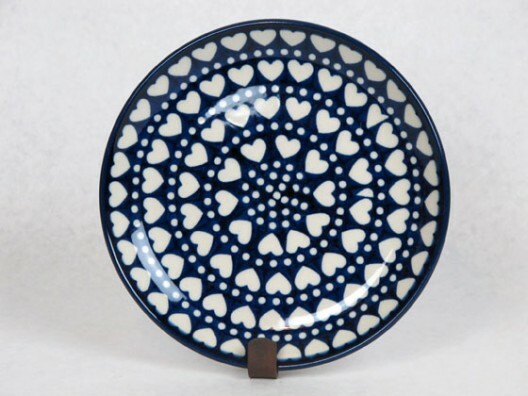 to learn more about the art of polish pottery, please visit the ceramika artystyczna cooperative website.